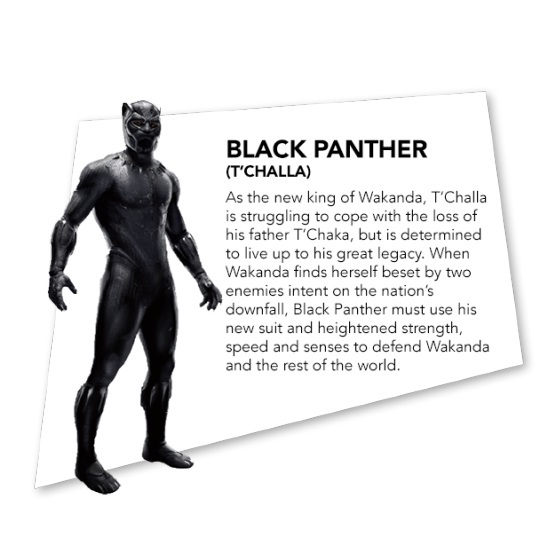 Some official character bios for the Black Panther movie have been discovered and new information about the characters. 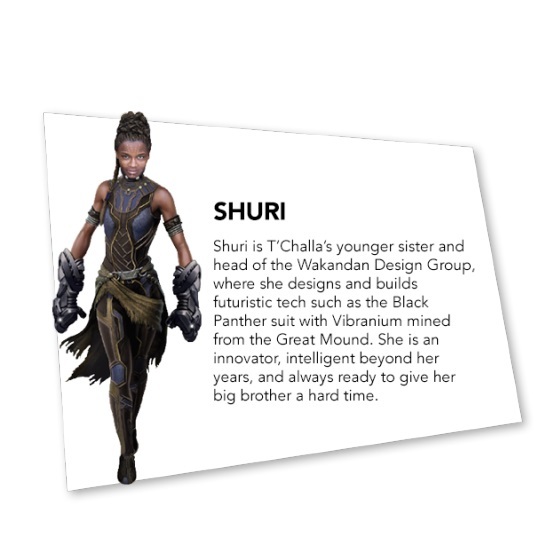 Character descriptions for some of the villains and heroes of Black Panther have been found on the official Toys 'R' Us website for the movie. Erik Killmonger, whose original name is N'Jadaka, becomes an American soldier after leaving Wakanda. He changes his name to the rather bland "Erik Stevens" but gets the nickname "Killmonger" because he likes to kill. Nakia and T'Challa used to date. This is explicitly forbidden by the code of the Dora Milaje and may have larger repercussions. While it's not new, the reference to the "Great Mound" confirms the Vibranium mine. In the comics, the Great Mound is where the all the deposits of Vibranium are found in the world. It's also where a meteorite landed 10,000 years ago that created the mineral capable of absorbing sound and energy. It's been speculated that this is where the missing Soul Stone is and why Thanos is invading Wakanda. Thanos is looking for the six Infinity Stones - Reality, Time, Space, Mind, Soul, and Power - to give him the power to control the universe. "As the new king of Wakanda, T'Challa is struggling to cope with the loss of his father T'Chaka, but is determined to live up to his great legacy. When Wakanda finds herself beset by two enemies intent on the nation's downfall, Black Panther must use his new suit and heightened strength, speed, and senses to defend Wakanda and the rest of the world." "The head of the Dora Milaje, an all-female special forces group, Okoye is a fiercely loyal protector of Wakanda who isn't afraid to question her king, but would defend him with her life. 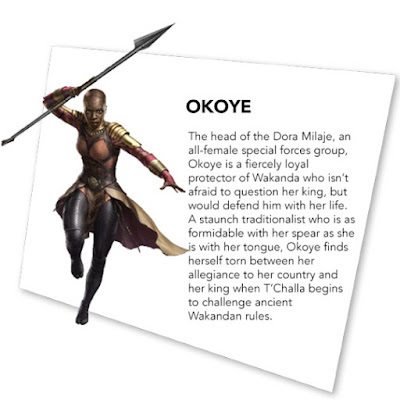 A staunch traditionalist who is as formidable with her spear as she is with her tongue, Okoye finds herself torn between her allegiance to her country and her king when T'Challa begins to challenge ancient Wakandan rules." "Shuri is T'Challa's younger sister and head of the Wakandan Design Group, where she designs and builds futuristic tech such as the Black Panther suit with Vibranium mined from the Great Mound. She is an innovator, intelligent beyond her years, and always ready to give her big brother a hard time." 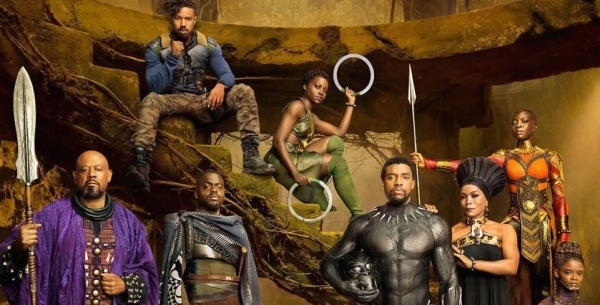 "Wakandan spy pulled from her mission abroad by her former flame, T'Challa, Nakia consistently gets involved in conflict for the good of others. adamant to use her abilities to help those in need. 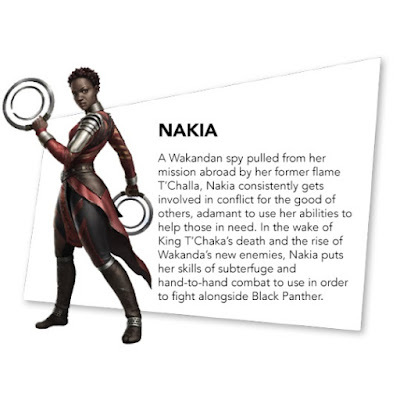 In the wake of King T'Chaka's death and the rise of Wakanda's new enemies, Nakia puts her skills of subterfuge and hand-to-hand combat to use in order to fight alongside Black Panther." 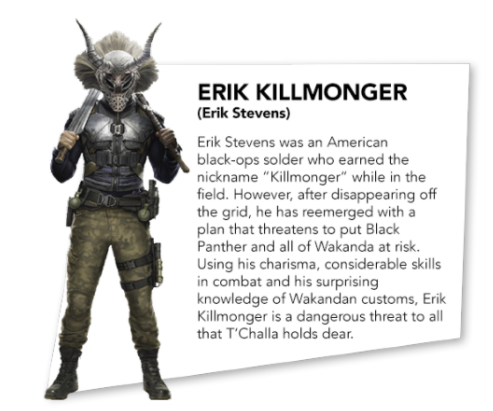 "Erik Stevens was an American black-ops soldier who earned the nickname "Killmonger" while in the field. However, after disappearing off the grid, he has reemerged with a plan that threatens to put Black Panther and all of Wakanda at risk. Using his charisma, considerable skills in combat and his surprising knowledge of Wakandan customs, Erik Killmonger is a dangerous threat to all that T'Challa holds dear." 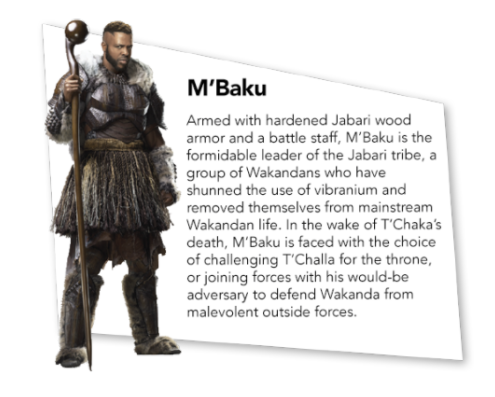 "Armed with hardened Jabari wood armor and a battle staff, M'Baku is the formidable leader of the Jabari tribe, a group of Wakandans who have shunned the use of Vibranium and removed themselves from mainstream Wakandan life. In the wake of T'Chaka's death, M'Baku is faced with the choice of challenging T'Challa for the throne, or joining forces with his would-be adversary to defend Wakanda from malevolent outside forces." 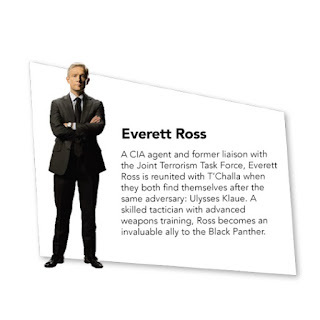 "A CIA agent and former liaison with the Joint Terrorism Task Force, Everett Ross is reunited with T'Challa when they both find themselves after the same adversary: Ulysses Klaue. A skilled tactician with advanced weapons training, Ross becomes an invaluable ally to the Black Panther." Check back for more Black Panther movie news on the Geek Twins! What do you think of the character information?